In the 2015-2016 school year, students were arrested 50 times at SPPS. Last year, only five students were arrested. Photo courtesy of Wikimedia Commons. On May 25, 2016, St. Paul School Resource Officer Bill Kraus forcibly arrested then 19-year-old Darion Bell outside of St. Paul Central High School. Bell, a Black youth who had recently transferred out of Central to the High School for Recording Arts, was on Central’s campus to visit one of his former teachers. Kraus used mace to detain Bell and violently slammed Bell to the concrete. Kraus, a tall and broad white man with more than 23 years experience in policing, kept his knee in the center of Bell’s back, despite Bell’s multiple cries of pain and cries for help. The end of the incident was caught on camera. (Note, the following video contains images of police violence and adult language). Bell’s arrest – and the lack of discipline for Kraus – capped off a school year punctuated by violence and discrimination against students of color from the police, teachers and administration of St. Paul Public Schools (SPPS). In the fall of 2015, that same school year, a school resource officer maced a group of students to break up a fight at Como Park High School, while another student was tased for “obstructing legal process with force and disorderly conduct” according to the incident report. The student had apparently resisted leaving the building after being suspended, according to a report from MPR News. In March 2016, teacher Theo Olson was put on paid administrative leave for making multiple racist comments on social media and his personal blog. The district’s handling of Olson’s case, which many families noted was indicative of an entire school district culture and not just one outlier teacher, sparked a protest during a March 2016 meeting of the SPPS Board of Education. After Bell’s arrest, students at Central High School staged a walk-out in protest of school resource officers. “Do we want to contribute to the school-to-prison pipeline, or are we really trying to protect students?” Alaziz continued. The stage was set, and in such a climate the call from parents and students was to drastically change policies around School Resource Officers (SROs) or get rid of them altogether. In August 2016, SPPS renegotiated its contract with School Resource Officers, the St. Paul Police officers who work in the high schools of the district. The 2016-2017 school year contract greatly reduced the officers’ involvement in student discipline, called for more training and records keeping of student engagement, while also creating pilot restorative justice programs around the district. But despite all the new directives and policies, families from the school district still feel that there is a persistent culture of intimidation and discrimination. In short, the district has work to do. And the SRO contract is being renegotiated again this summer. St. Paul Public Schools currently employs nine School Resource Officers, four of whom are people of color. There is one SRO posted at each of the district’s high schools, with two SROs designated as “mobile” positions, offering backup at the high schools as needed. Bill Kraus, who violently arrested former SPPS student Darion Bell in May 2016, is a mobile officer. The new SRO contract brought a litany of changes to how the SROs operate and cost the district $884,499 – money that many view could have been better spent elsewhere. “I was in a classroom where the textbooks, my teacher had students blacking out certain parts of it because they were so outdated. And there are so many parts of the school that need renewing, but there’s no money for it,” said Central student Makkah Abdur Salaam at the July 2016 meeting. SROs now no longer arrest students for low-level offenses, such as petty theft or fighting without a weapon. Instead, SPPS now has a greater emphasis on restorative justice. Six pilot programs were granted $150,000 each across the school district this past year, with the program poised to grow to nine pilot sites next year. The district also added more school counselors, social workers, psychologists and nurses. This change has greatly reduced the number of arrests at SPPS. In the 2015-2016 school year, students were arrested 50 times at SPPS. Last year, only five students were arrested. Both years are down significantly from the 2014-2015 school year, when 129 arrests were made. But there were even more changes this past year, ones that Olson said were designed to “humanize” the SROs and “to bring more understanding,” both for the students and the SROs as they perform their job. The officers now wear a blue polo shirt rather than the standard police uniform to appear less intimidating. The district also introduced the SROs to students and families more visibly this year, by having them participate in welcoming events and sending out Q&A interviews of the SROs “so the community can get to know them,” Olson said. The SRO interviews are not available in any language other than English, a fact that was not lost on Diriye, who primarily works with East African families. As a former dean of students, Diriye said that meaningful outreach to families – with proper translation services and proactive engagement – should have been implemented on SRO issues long before the new contract. “You have to show the parents and the kids that you care, that means you call personally. Not email. You have to build a relationship. Right now, there’s not enough outreach, the only time they send a message is when the student is already in trouble,” Diriye said. SROs also now track their engagement with students – something that wasn’t done until this past school year, despite the district tracking metrics on almost every other aspect of a student’s academic career. The tracking is subjective (categorized as positive or negative) and is self-reported by the SROs. Khulia Pringle, an organizer, educator and parent of a former SPPS student, is highly skeptical. When the SROs self-report interactions, Pringle said that what counts as an interaction is unclear. There’s also a lack of clarity around what counts as positive. And while Olson said the district is working to ensure that students and their families know their rights and have access to outside resources after a confrontation, she also pointed out that she and the district are still working on better communicating with students. What has perhaps brought about the most change in Olson’s opinion, was that all nine SROs were required to participate in monthly facilitated “reflective conversations” to help them with de-escalation by talking through their fears and feelings and to understand what a confrontation would look like through the lens of a student or the student’s family. “We’re encouraging them to think about ‘How am I presenting myself in this situation?’ We have to acknowledge that their might be negative trauma with the police, and our SROs have split seconds to make a decision sometimes,” Olson said. “We’ll never be 100 percent perfect. It’s unrealistic to believe that there’s a full embrace of the concept, but we believe we have a strong momentum going,” Olson said. By the numbers, SPPS is bucking national trends. 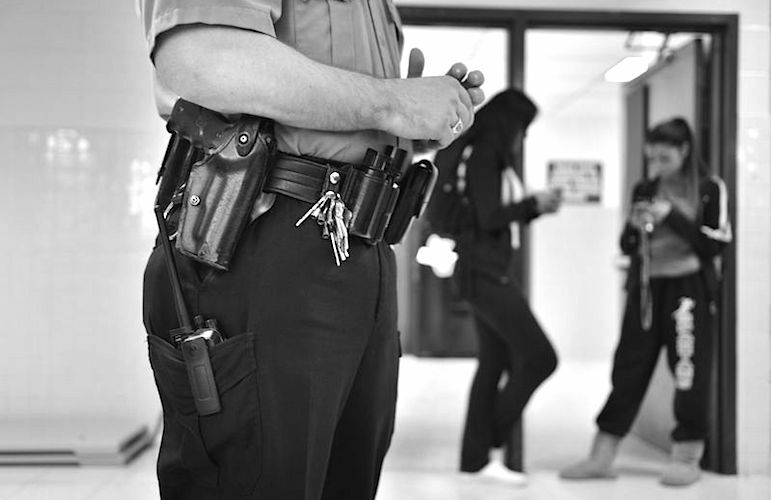 Schools with SROs are usually five times more likely to arrest than schools without. And according to a 2010 report from the National Center for Education Statistics, the number of SROs increased nationally by 27 percent from 1997 to 2007. But in St. Paul, from 1989 to 2016, SROs were reduced from 17 officers to nine. Due to budget constraints, Olson said the two mobile officers will be cut in the 2017-2018 school year, leaving only seven SROs in the district. But for all the improvements, problems persist. Tyrese Clarke was an honor roll student from fourth through ninth grade in St. Paul Public Schools. His mother, Melissa Gallagher, describes him as well liked and a class clown. Clarke has ADHD, but that has never hindered him. He has been working and earning his own money since he was 15. Clarke and Gallagher said that they felt like Clarke was racially targeted. Due to the amount of stress the treatment brought him, Clarke left SPPS in November. Clarke and Gallagher’s experience is not unique. Pringle’s daughter experienced similar issues until she left SPPS. Bell dropped out of school altogether after the incident with SRO Kraus. For these reasons, Pringle would like to see SROs phased out of schools, especially in St. Paul. If the district reduced spending on SROs, Pringle suggested SPPS invest the nearly $900,000 from the SRO contract into training parents and elders as community-led accountability partners for classrooms. In her view, it would be a lot cheaper than police officers, and would be more effective too. “With students, it’s about building real relationships in community, that’s the only way we’re going to figure this out,” she said. The next SPPS Board of Education meeting will be held on Aug. 15 at 6:05 p.m., preceded by a public comment period at 5:30 p.m. While I don’t agree with SROs in general, the main incident cited was one where the student was belligerent and refused to leave. I would expect any student black or white behaving like that with an officer could expect to get treated that way – firmly and without a doubt. That said, the Tyrese Clarke situation is shocking, saddening and a real downer — don’t teachers get any kind of cultural bias training at all! If this is what is happening in general, we are wasting many lives here in this town. The problems overall to me seemed related to cultural issues — a clueless Hispanic Superintendent who obtained power, and took the Hispanic approach of “now it’s my turn to be in power, do it my way, or the highway!”; I have seen Hispanics, even those who looked very “black” see themselves as “white” and at the same time viscerally fear those who are “black”. I don’t think we take seriously enough the various cultural issues that can arise as we become less homogeneous. Meanwhile the many ethnic groups of Saint Paul have suffered under her tenure. Good riddance. If there was any way I could sue the st.paul humbolt school Principal I would for him failing my son and Discriminating him and the board of Education. At Harding high School we have one of the best SRO officer . I see how he interact with students and staff. He know students by names. Another SRO was officer Simmons who retired and work st Johnson high School and also was their basketball coach. The Kraus arrest looked pretty much by the book, not brutality. I think we need to pick our battles and not cry wolf every time an officer has to use force.